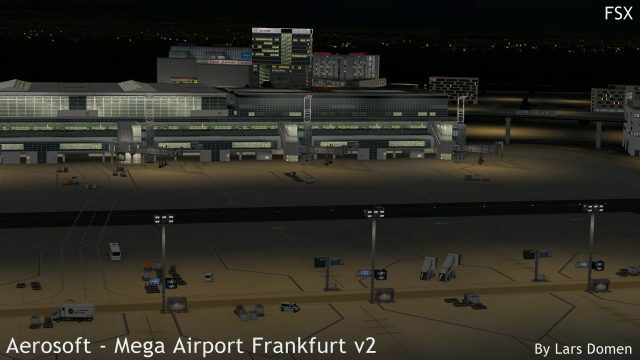 With Mega Airport version 2, Aerosoft and the German Airports Team revisit Germany’s largest airport. Let’s take a look and see how this remake turned out! 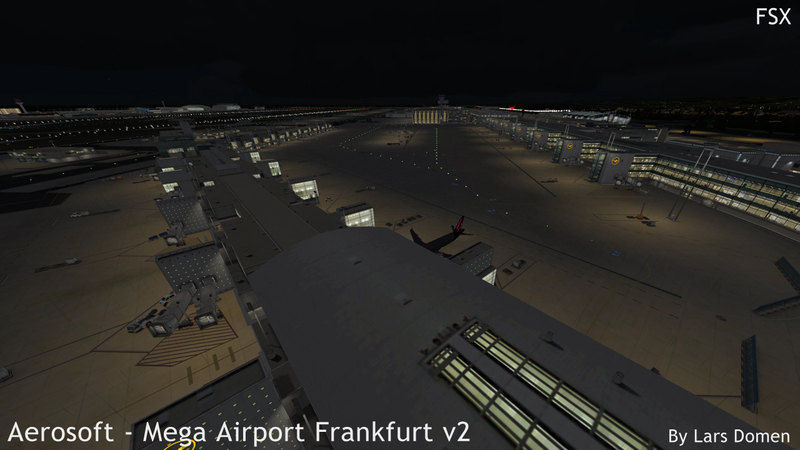 Frankfurt Airport (IATA: FRA; ICAO: EDDF) is an international airport in Frankfurt, Germany. It’s located about 10km from the centre of the city of Frankfurt, Germany’s fifth largest city by population. The airport opened at its current location in 1936 with a grass runway. At this time, the airport handled fixed-wing aircraft, but was also a major base of airships. The infamous Hindenburg (LZ 129) called Frankfurt home. 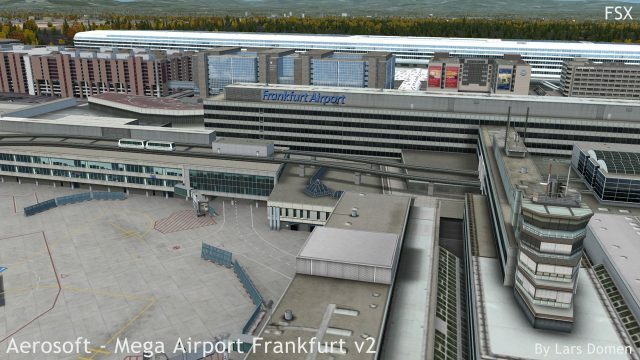 Frankfurt Airport was used by the German Luftwaffe during WWII. Following the war, Rhein-Main Air Base was constructed at the site for use by the United States Air Forces in Europe (USAFE), remaining in use as such until 2005. During the Berlin Air Lift, Frankfurt was one of the main bases supplying blockaded Berlin. 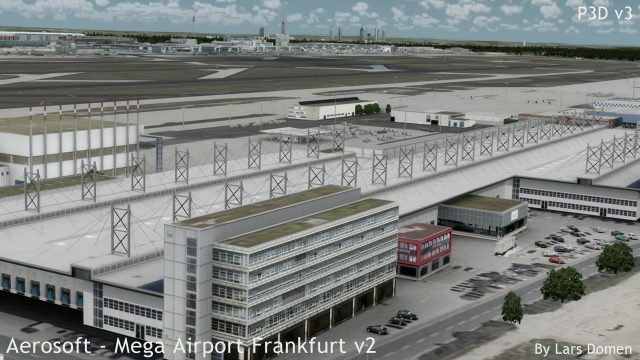 Commercial operations at the airport started growing in the 1950’s, with Frankfurt Airport becoming Europe’s second busiest airport by the 1960’s. Continued growth of the airport led, over the years, to the addition of a third runway, a second terminal, and finally in 2011, a fourth runway. A third terminal is currently under construction on the site of the former Air Base. 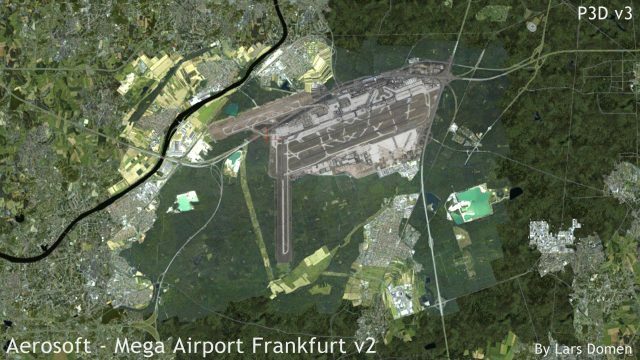 In 2015, Frankfurt Airport was the 4th busiest in Europe in terms of passengers, and the first in terms of cargo handled. 65% of all intercontinental flights in and out of Germany use Frankfurt Airport. 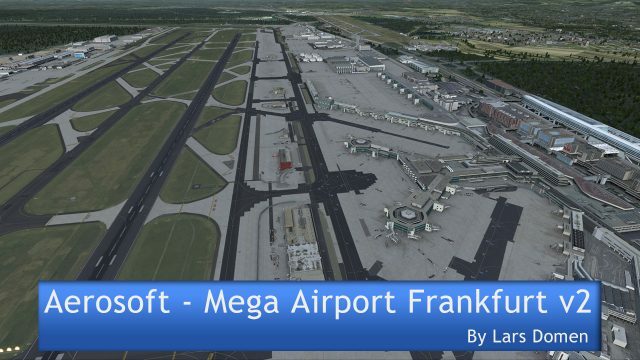 Mega Airport Frankfurt is, quite obviously, part of the ‘Mega Airport’ series by Aerosoft. Buying the product will set you back about €25 (excl. 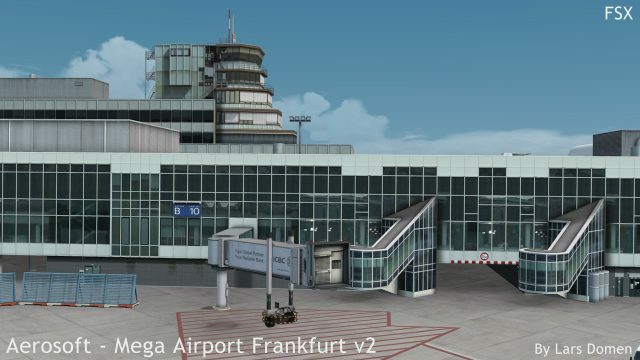 VAT), but there is a discount available for customers of the previous Mega Airport Frankfurt. If you purchased this product, you can get the new one for €19,28 (excl. VAT). The download comes in quite big, at just under 1,6GB. Once installed, MA Frankfurt V2 takes up about 2GB of hard drive space. Installation is the usual from Aerosoft, a tried and tested method that works flawlessly. All it requires from the user is an email address, and the Serial Number received when buying the product. The single installer allows installation in 4 different simulators: FSX, FSX Steam Edition, Prepar3D V2 and Prepar3D v3. I tested Mega Airport Frankfurt V2 in FSX Steam Edition and Prepar3D v3. 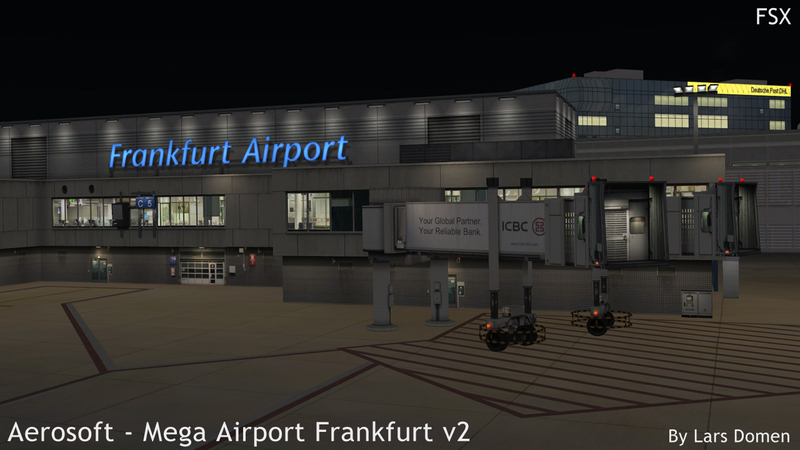 My first impression when loading MA Frankfurt V2 for the first time was: “Wow, this is a big airport!”. And indeed it is. My second thought was: “It’s not very pretty, is it?”. But before you draw your conclusions, that was a reflection of the airport, not the Aerosoft product of that airport. Over time during testing, the feel of the airport grew on me. But fact remains that Frankfurt has a distinct ‘industrial’ feel to it. Of course, this is true for most large airports. 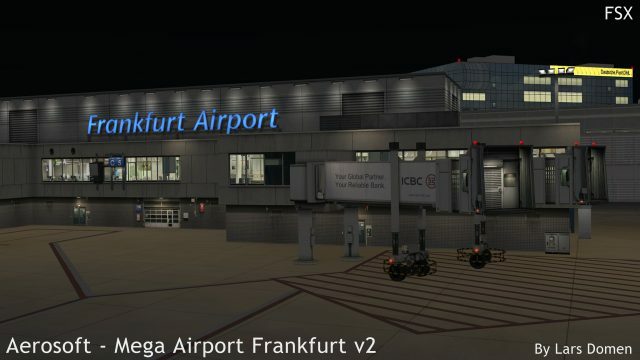 I’ve never been to Frankfurt Airport myself, but that this industrial atmosphere is so noticeable, speaks in favour of Aerosoft’s rendition of this airport. Let’s take it apart from the bottom up. First, the terrain textures. 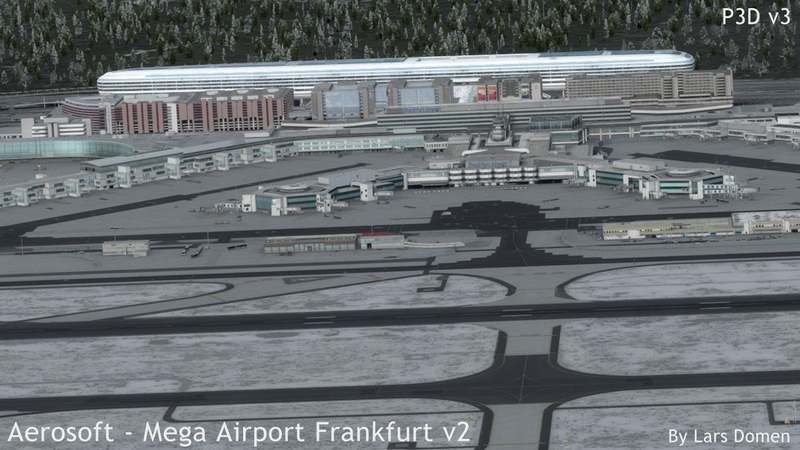 MA Frankfurt V2 comes with a set of terrain textures that extend quite a bit outwards from the airport. The sharpness and quality is very good. 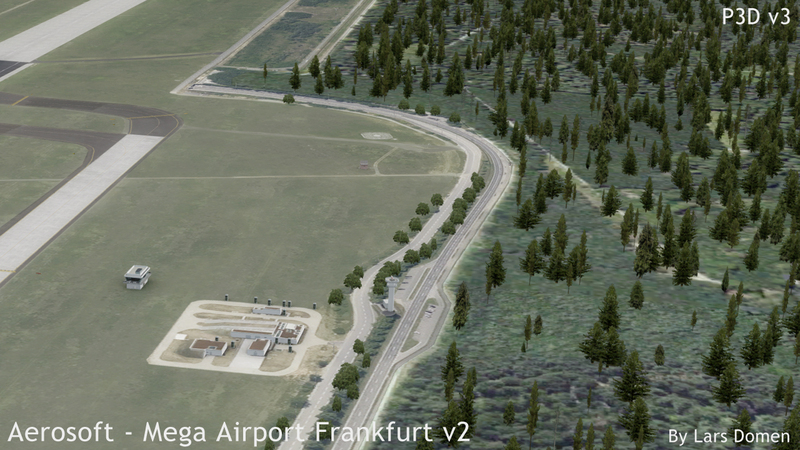 The terrain textures come in 2 flavours: on the airport site, where they’re always very sharp, and just outside the airport, where the resolution is subject to the Scenery Texture Resolution slider in FSX/P3D. There is, however, a noticeable colour difference between the 2. Not extreme, and not a problem at all when flying, but noticeable if you look for it. The border between the terrain textures in this product don’t blend smoothly with Orbx FTX Global textures. Mainly due to the fact that the textures with MA Frankfurt V2 are less saturated (especially the forest greens) than what we’re used to in FSX/P3D. I can’t comment on how well it blends with other large-area scenery products covering Germany. 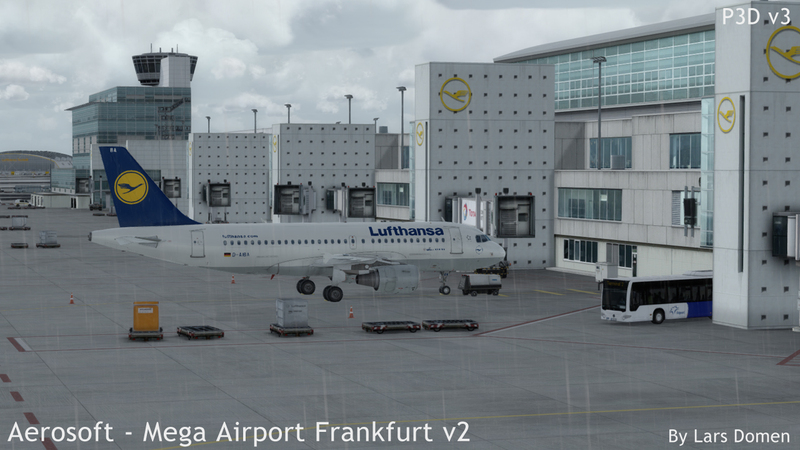 MA Frankfurt V2 includes distinct sets of textures for the different seasons. Spring and summer look the same, but autumn and winter look markedly different. Autumn brings textures with brownish grass. In winter, snow is ever present. Very nice! 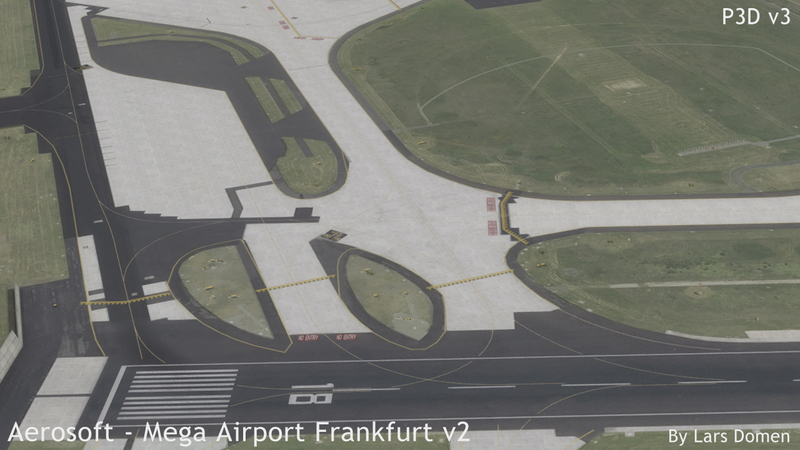 The look of the hardened surfaces at Frankfurt is very good. The textures are sharp, the markings are smooth and easily readable. Overall, very pleasant to look at. 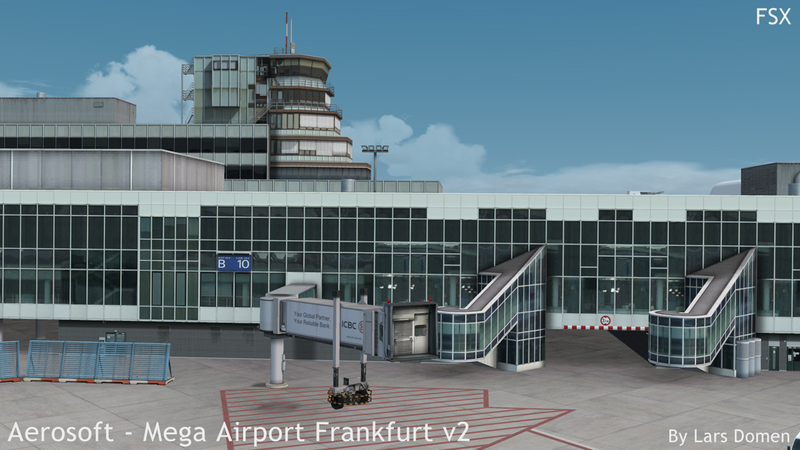 Especially noteworthy is the patchwork of lighter and darker concrete and asphalt, perfectly representing the real airport. What I did note, is that these hardened surfaces are remarkably clean. There’s very little rubber left behind, or signs of wear and tear. There is some on the runways and parking positions and gates, but not much. I only have Google Maps or similar services to compare it to, but the look is quite different there. If we look at the buildings, there’s a lot to see. 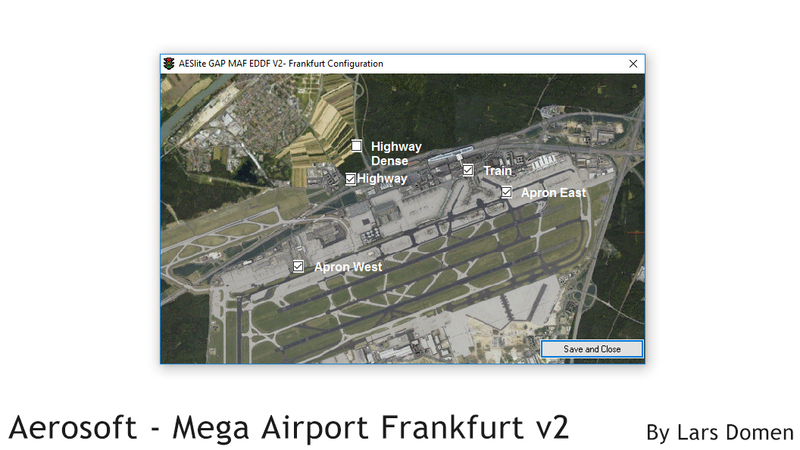 Indeed, there are so many buildings at Frankfurt Airport, that it’s impossible to even begin and list them all. Especially the north side of the airport is one large building after the other, although the south side isn’t neglected either. The modelling quality of the buildings is very good in my opinion. The many different buildings are well represented, with the necessary details present. 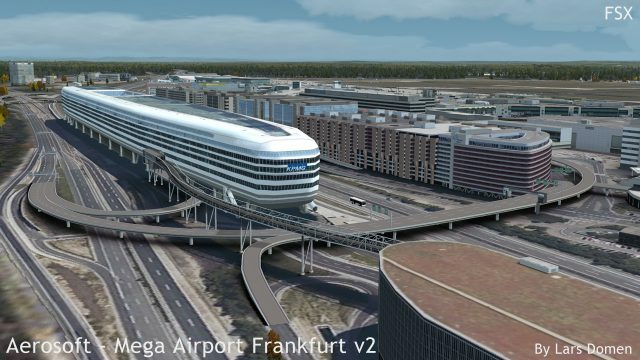 Due to the size and complexity of the airport, not everything could be modelled. 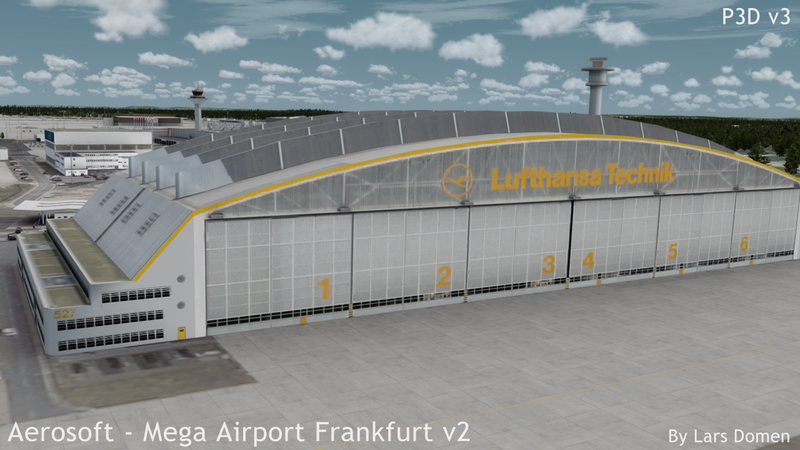 Things like roof-mounted air conditioning units and skylights, and some other detailed features, are mostly only textured, not modelled. 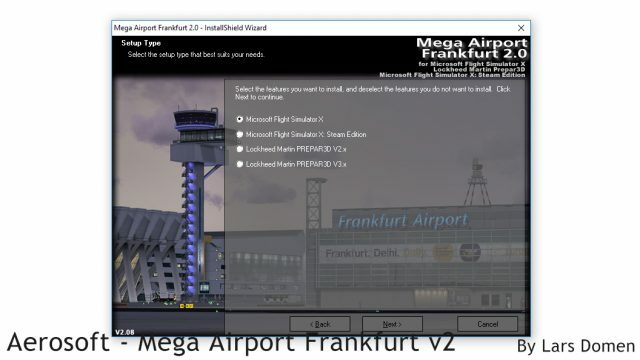 But considering a typical use of the airport, either departing or arriving using a commercial aircraft, and the fact that they had to keep the scenery manageable for a normal PC to run, I think this is a sensible choice. If we look at the texturing of the airport buildings, the story differs a bit depending on where you look. At the gates, and other places where most pilots will find themselves often, the textures are of very good quality and very sharp overall. On some other buildings though, the texture resolution is markedly lower. Not so low as to look bad from a normal viewing distance, but noticeable when you look closer. A compromise, I suspect, to keep memory footprint down. Remember, doubling the resolution quadruples the filesize. 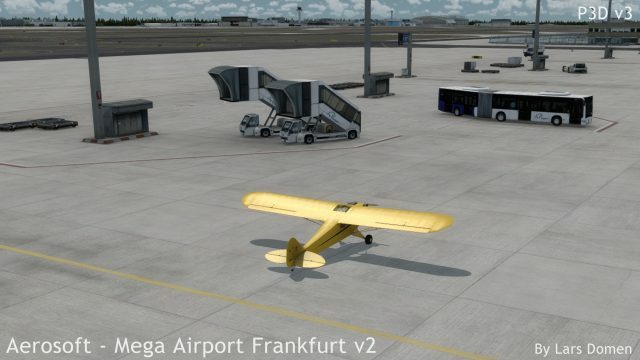 Finally, there’s a lot of clutter and miscellaneous objects to be seen around the airport. I’m quite surprised by the sheer amount, to be honest, considering the size of this airport. 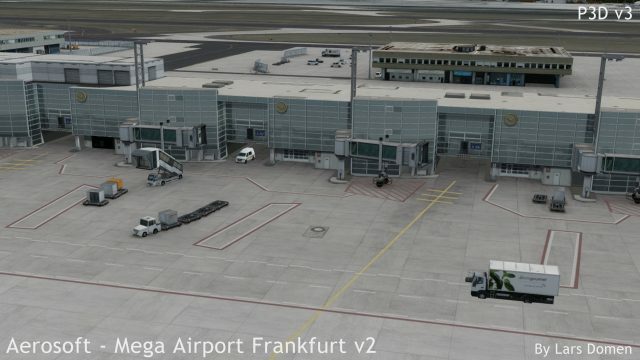 Of course there’s the jetways that connect aircraft to the terminals. Many gates have 2. They’re quite detailed and certainly good looking. 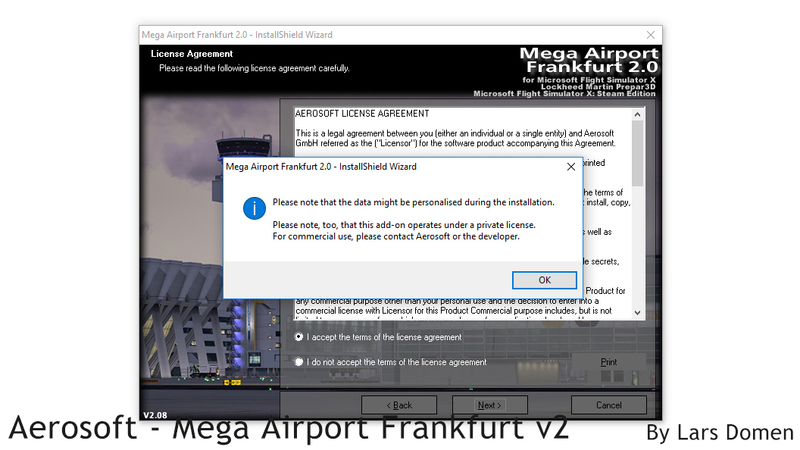 To make them actually connect to the aircraft, you need Aerosoft’s AES though. 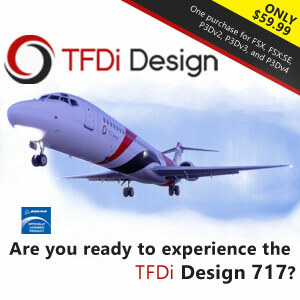 For now, this leaves FSX:SE and P3D users wanting. Apart from those jetways, there’s a lot of other items to be found around the airport. Lots of lightpoles and traffic signs (both for aircraft and ground based vehicles). But also airstairs, service vehicles, luggage and cargo trailers and lots of busses. There’s lots of these vehicles statically placed around the airport. But there’s also quite the number driving around. 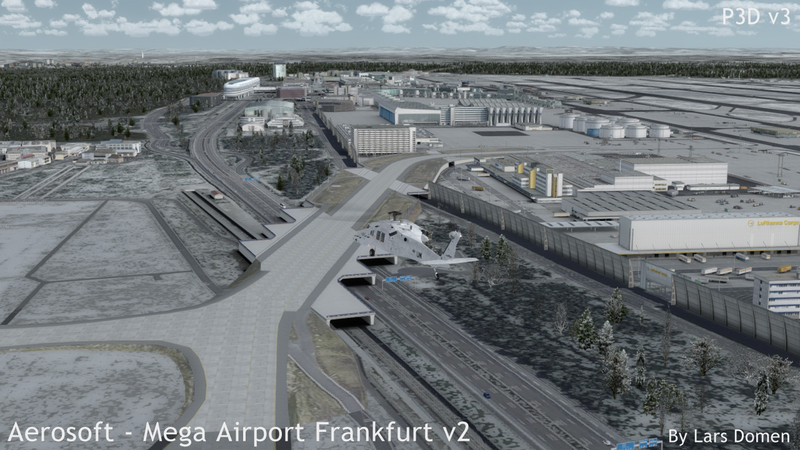 The effect is an airport that feels quite dynamic and alive, even without AI aircraft around. Do note that the airport works with AI traffic (although the sim imposes some limits here regarding the use of the newest runway 07L/25R) but since my PC rebuilt I don’t have a traffic pack installed, and prefer to leave traffic turned off to put those resources in other settings or performance. 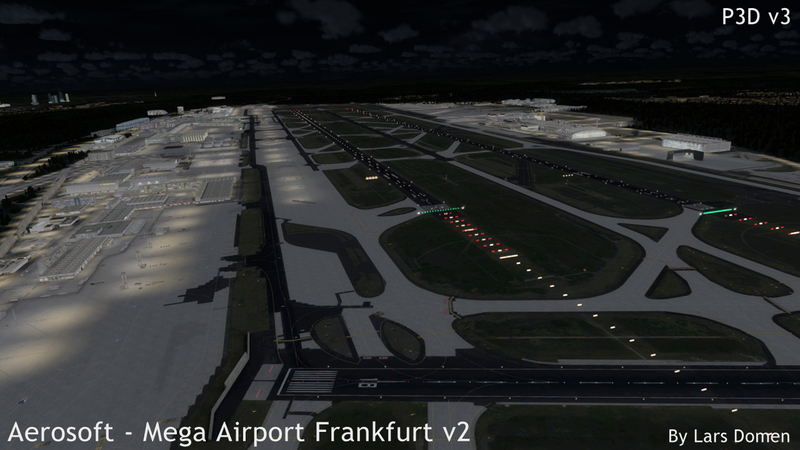 While I like MA Frankfurt V2 during the day, I’m even more impressed by how it looks at night. There’s lots of flood lighting at the airport, but it’s represented very artfully in this scenery product. Not over the top, not too strong, but looking very good and very realistic. You can clearly see this flood lighting and the lit-up buildings from a distance. 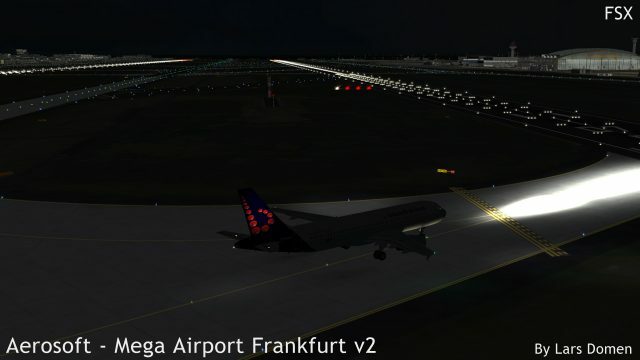 The next thing you see is the approach and PAPI lights, followed by the runway lighting. The taxilights only come into view when you’re closer. I’m quite impressed by this progressive behaviour. It feels very intuitive, and doesn’t distract from what’s important at the time. From very far: the airport and approach lights. Then the runway lights when you need them, and only when on the ground are the taxi lights useful. Overall, a very pleasing visual experience in my opinion. 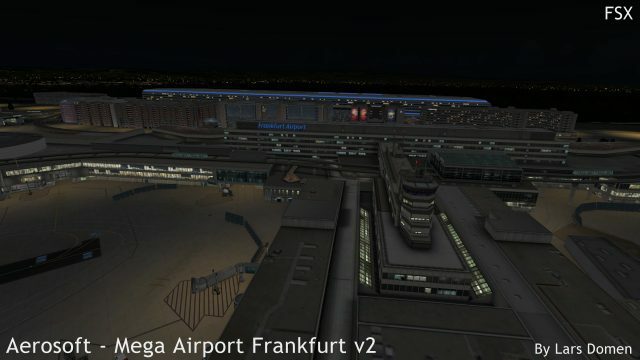 The compromises made to keep this large airport manageable in the sim, are visible when you look for them, but don’t detract from the core experience in my opinion. 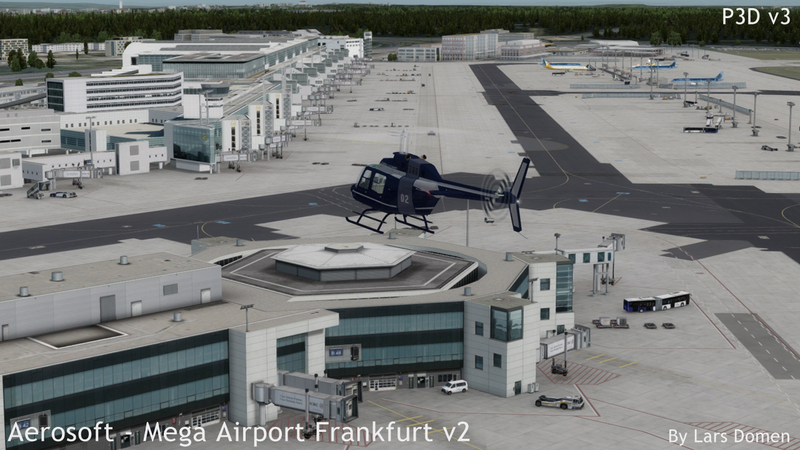 Along with the scenery itself, there are a couple of small extra’s installed with Frankfurt V2. First of all, there’s a manual. 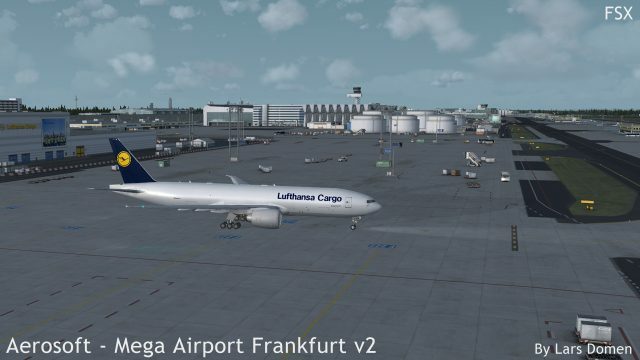 In both German and English, it covers subjects like system requirements, installation, credits, a history of the airport and some technical details. It also, very briefly, covers some ‘in sim’ items. A second (substantially larger) PDF document that comes with this product, are the charts for Frankfurt Airport. I always like it when these are supplied with the product! The charts in this case are provided by Lufthansa Systems FlightNav Inc. (very good charts, easy on the eyes and intuitive to use) and are as recent as April 2016. 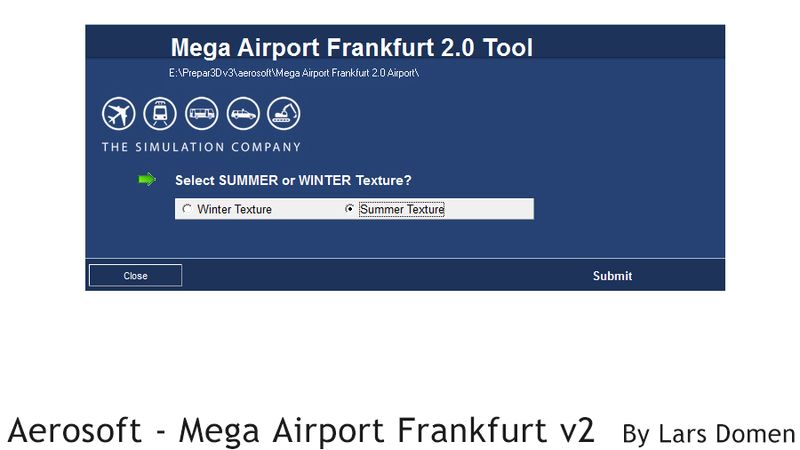 Finally, Mega Airport Frankfurt V2 comes with 2 external tools. 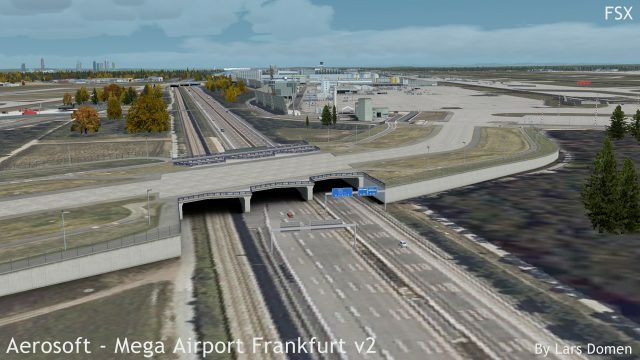 The first one is a small configuration tool which allows you to switch between summer and winter textures for some items where FS can’t do this automatically (namely, the taxiway bridges leading to the new runway). This is why you would use the Configuration Tool: notice the summer textures on the bridge, while everything else is in winter. 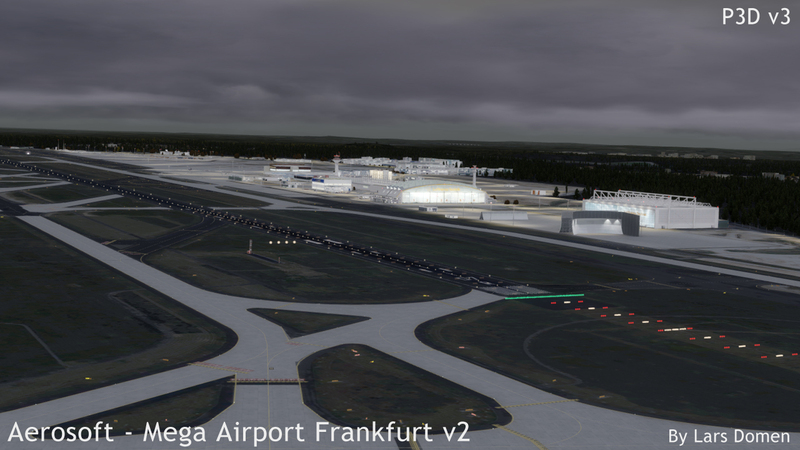 A second tool is exclusive to the FSX version, and allows you to configure the AESlite traffic. The airport traffic in P3D doesn’t use the AESlite system, and can’t be configured. I already wrote about how Frankfurt is a very large airport, and how the developers have made compromises to keep it manageable in our simulators. 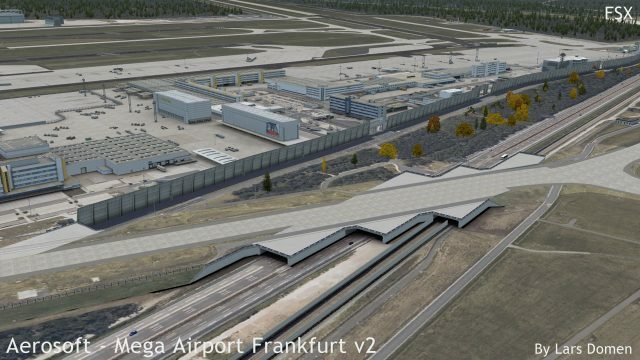 Nevertheless, performance remains a thorny issue with Mega Airport Frankfurt V2. First of all, frames per second, or FPS. While some people report low fps when using EDDF V2, I did not experience this. In the contrary. I am highly impressed with the frame rates I get when flying there. They are better than at any of the other large airports I’ve flown since rebuilding my system. Of course, this all depends highly on not only the scenery, but also the aircraft you use, your settings, and in no small part other add-ons, AI traffic in particular. Even more people report problems with Out-Of-Memory errors, OOM’s. There have been pages and pages written about VAS and OOM’s in FSX. 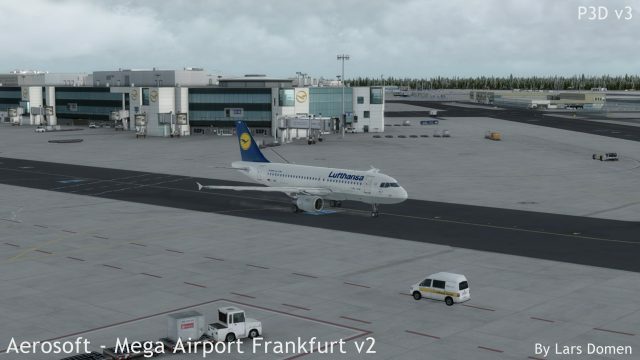 But for those who don’t know, let’s just say that FSX or P3D are limited to 4GB of memory usage. As soon as you try to load more assets than that, BOOM, game over. 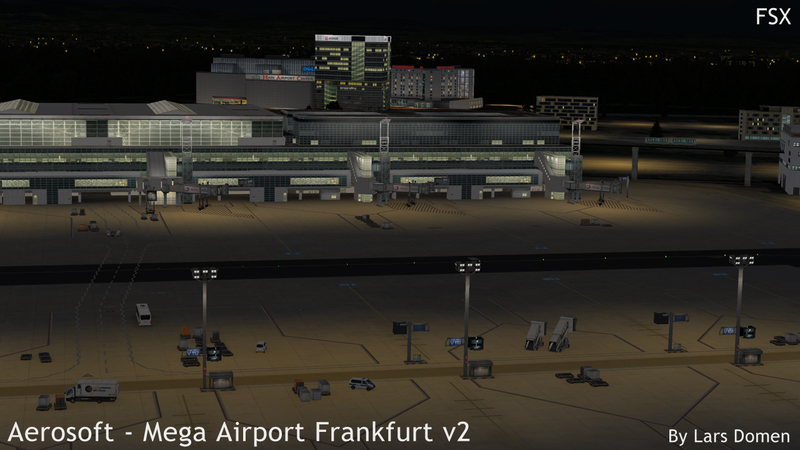 With Mega Airport Frankfurt V2, once again, mileage varies. Some people report no problems at all, some report incessant OOM crashes. A returning observation is that people seem to have problems when flying to Frankfurt, but not when doing the same flight in the opposite direction. Personally, I also ran into some memory problems at first when using Frankfurt. Turning down some settings has resolved the problem for me. 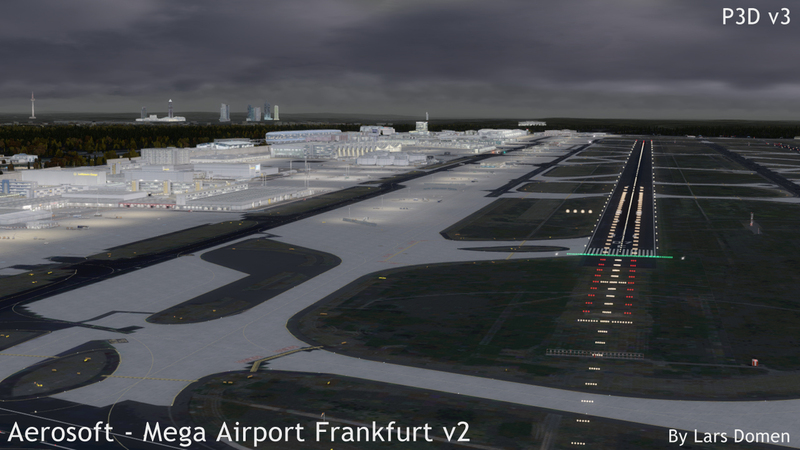 And just to be sure, I decided to compare the reported VAS usage at Frankfurt with the usage at that other very large Mega Airport: London Heathrow Extended. 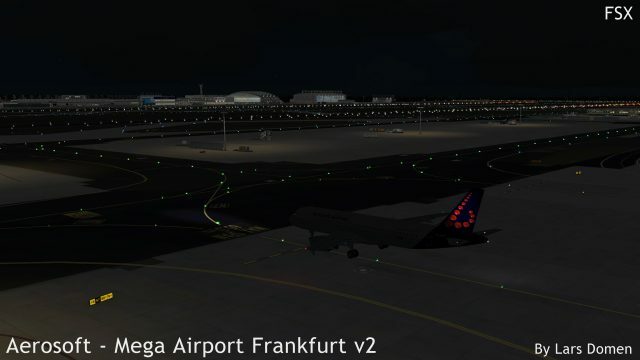 As it happened, the tool I used reported less VAS usage at Frankfurt! Of course, this is not the definitive answer to this discussion. I think the ‘your mileage may vary’ adage is the key here. 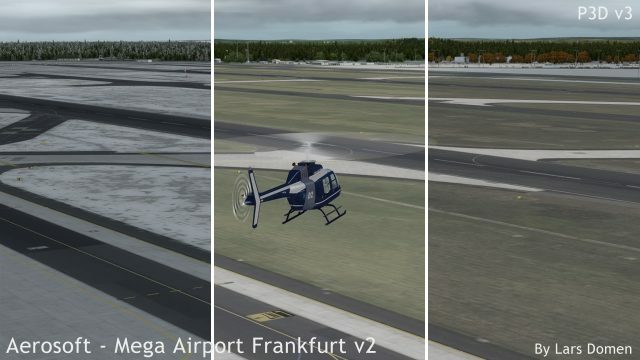 If you’re bent on running FSX/P3D at maximum settings, with a very detailed aircraft, ultra high definition (4096px) cloud textures, realistic weather with lots of cloud layers, and Ultimate Terrain or similar tools with all options enabled, you can be pretty sure MA Frankfurt V2 will be unusable. But so will many, many other airports. 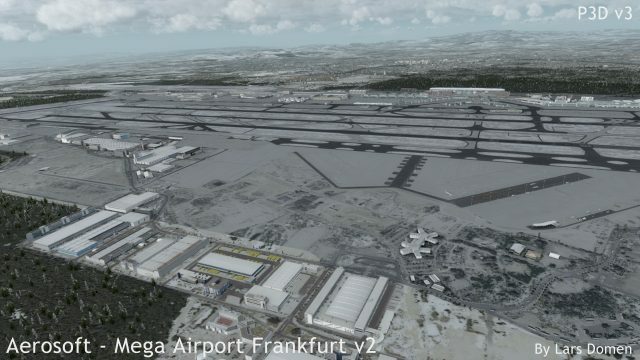 Nevertheless, I hope Aerosoft and the German Airports Team continue to look into this. 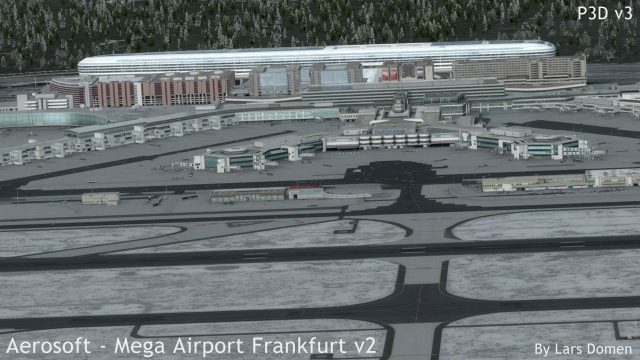 A very large airport located centrally in Europe, recreated for our simulators in high quality. And with remarkably good frames per second performance at that. Sounds like an absolute winner if you say it like that. But there’s always another side to the story. The most visible is ‘not insanely high resolution’ texturing on some buildings. It still looks very good unless you put your viewpoint directly against said buildings, and is an acceptable compromise in my opinion. And then there’s the reported OOM errors. With some tuning, I managed to mostly get rid of them, but it is something you should be aware of. That being said, I personally like this scenery product, a will be flying to and from it in the future for sure.